PHOTO BY JONATHON BIRD Upper Sandusky's Madelyn Shasteen competes during the Old Fort cross country invite on Saturday, Oct 1. The state cross country meet at National Trail Raceway in Hebron boasts the best talent in the state in the high school sport of cross country. Talking with multiple coaches in the area, the coaches are aware of what their participants are up against this Saturday, especially Bellevue coach Lee Booze, who is sending the area lone girls team in the Division II race. The Lady Red were runners-up at regionals at Hedges-Boyer Park last Saturday and would like to keep the momentum going into state Saturday. It will be the first trip to state for Bellevue as a team since 1999. Bellevue is a young team with a few really experienced veterans that have made a big impact this season. The Lady Red are led by Lauren Turner, who will be making her third trip to the state meet.Turner was 13th at regionals in 20:10.83. She was 80th (20:14.4) last year at the state meet. “It is her third trip this year, but I think this year she is really looking forward to running with her team,” Booze said. “Today, we just talked a lot about the course itself and the speed of the race, which she has had experience with and how to run with all of the other top competition. The other girls making their first trip to state are Taylor Waldecker (14th, 20:15.08 at regionals), Liz Ish (19th, 20:29.73), Madelyn Verhoff (20th, 20:33.79), Lindsey Spurlock (50th, 21:40.8), Madison Raifsnider (58th, 22:00.82) and Casey Santoro (65th, 22:26.63). “We’ve looked at some of the statistics of the other teams and I think our top goal should be to finish in the top half of the results,” Booze said. “At least at the end of the day, we can say we have exceeded our goals if we perform to the best of our abilities. If we run exceptionally well, we can do that. We want to keep the momentum from last weekend going.”This team is definitely living proof that hard work pays off. We do have some natural talent, but this is a group that grinds it out and they do the little things to always make themselves better in the sport. 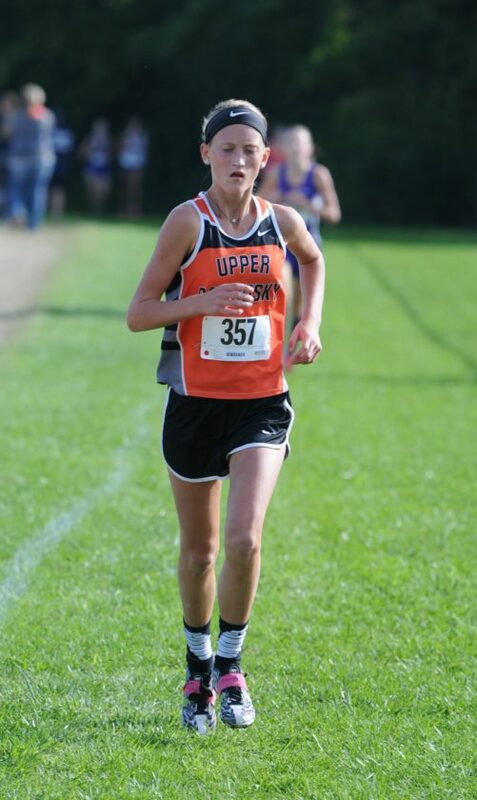 They are an embodiment of what high school cross country is all about putting a lot of sweat into this sport.”Also making their first trip to state is Upper Sandusky sophomore Madelyn Shasteen. Followers of the sport of cross country would not be surprised by her qualification because of her strong freshman season and the fact she’s been in about every race this season for the Rams. Shasteen was 12th this year at regionals in a time of 20:03.82. Arnold said they won’t be able to make it down to state before the race on Saturday, so they have been going over some of the map of the race and will talk strategy up until the race.“She’s a pretty focused hard-worker. She has some natural talent of course, but she takes our advice and she’s very coachable,” he said. “This will certainly be a learning experience for her. St. Wendelin’s Sophia Volpe may be the darkhorse of the meet. The senior only picked up the sport a few weeks ago and will run just the sixth race of her career Saturday. But she enters with one of the best times, She ran third at the Tiffin regional in 19:15.15 –her fastest time is 19:08.12 from the district race — and just five girls in the Division III state race enter with faster regional times. Normally a volleyball player, Volpe picked up cross country late in the season as a way to prepare for college track. Reinhart said he’s been trying to get Volpe, a middle distance runner in track, on the cross country course for years.Despite her inexperience with the sport, Reinhart said Volpe has shown plenty of intelligence when it comes to cross country racing — using hills to her advantage, playing the wind, keeping packs at a comfortable distance, making moves when needed. “Watching Sophia run her fifth meet last week, she looks like she’s been coached in cross country since junior high,” he said. “Just looked like a veteran because she’s an intelligent young lady, but translates everything right into the race and just looked like a pro out there. As for Carey’s Keely Wentz, she’s making her second consecutive appearance at the meet since qualifying for state as a freshman.She placed 21st in 19:22.4 a season ago. “Keely is a very talented individual, has rare ability of having speed, and if she paces herself out well can run people down in a race,” Carey coach Dean Kessler said. “One of her goals was to go to state all four years, and she’s halfway there.”As for goals for the race, Kessler said Wentz can have a really strong performance.“She’s fully capable of just about anything she wants to set her mind to,” he said.